While I didn't go a bundle on the Han Solo Mighty Mugg I recently reviewed, I have to admit I'm warming to them. Sure, I'm not a collector of Bobbleheads or Funko's Pop Vinyl figures, because I find them to be rather pointless and more than a little tacky. So, by default I should not be attracted to Mighty Muggs. I now see that I've been coming at this from the wrong angle. Like Bobbleheads and the Pop Vinyl releases, you're only going to enjoy a Mighty Mugg of a character that you truly love. For some unfathomable reason I seem to have become a huge Stormtrooper fan... I've accidentally managed to acquire quite a range of Stormtrooper items over the years. 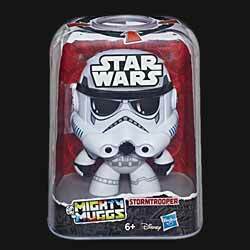 When I saw this Mighty Muggs Stormtrooper (non) action figure, the heart of the young boy in me melted. As with the others in the range, if you push its head down the face revolves to display one of three different facial expressions (in this case: normal, angry, and confused - see animated image at the foot of this review). It's cute, it's cool and it already comes housed in its own display case. In fact the hole in the top is an added bonus for collector's as it means you can press down on the head to change the character's facial expression, but still leave it packed in the box in mint condition. While I still have my reservations about these items as anything other than dust gathering ornaments, I did actually warm to this one.